I just finished making my first Christmas card this year! 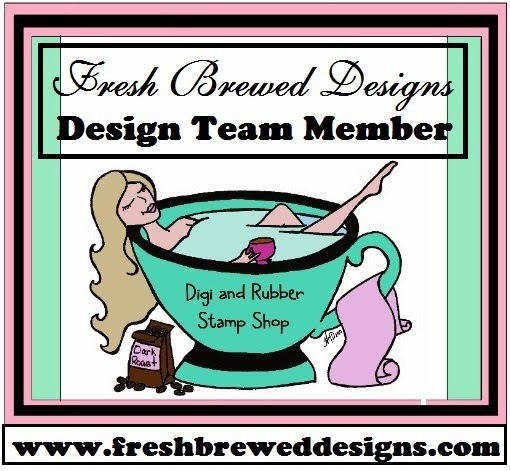 I got this digital stamp from Fresh Brewed Digi's and it's called, "Meet Me Under The Misteltoe". This stamp was a lot of fun to color! I used Baja Breeze SU cardstock and SU designer paper. I tore around my colored image so that I would have more space on my card for paper and embellishments. I used crystal effects and glitter on the fur of the dress and added tiny pearls to her boots. Red stones worked out perfectly for the mistletoe. The lace, ribbon, Bling and tule is from my stash of treasures. Fresh Brewed Challenges You Put A Song In My Heart "I Saw Mommy Kissing Santa Claus"
Lollypop Crafts #41 Inspired by song "I Saw Mommy Kissing Santa Clause". Moving Along With The Times #103 Inspired By Song "I Saw Mommy Kissing Santa Claus". Crafts & Me Challenge #39 Bling It On! What a fab card Sheryl, love the embellishments. Thank you so much for sharing it with us at Let's Craft and Create. Super card and fab image lol great connection to your song choice too! Hi Sheryl, great card, thanks for joining us this week at creative inspirations. Sheryl, this is one fantabulous card!!!!!! I absolutely love it!! The sheet music is pure perfection. Thanks for joining us at Freshly Brewed Challenges. Thanks for the wonderful comment. It made my day. Welcome to to the team. You have awesome projects also.